The best laid plans of mice and men and all that. Geoff and I had arranged an early morning start, well more like the middle of the night actually. We headed off at 3am with our sights firmly fixed on arriving at our chosen destination before anyone else. 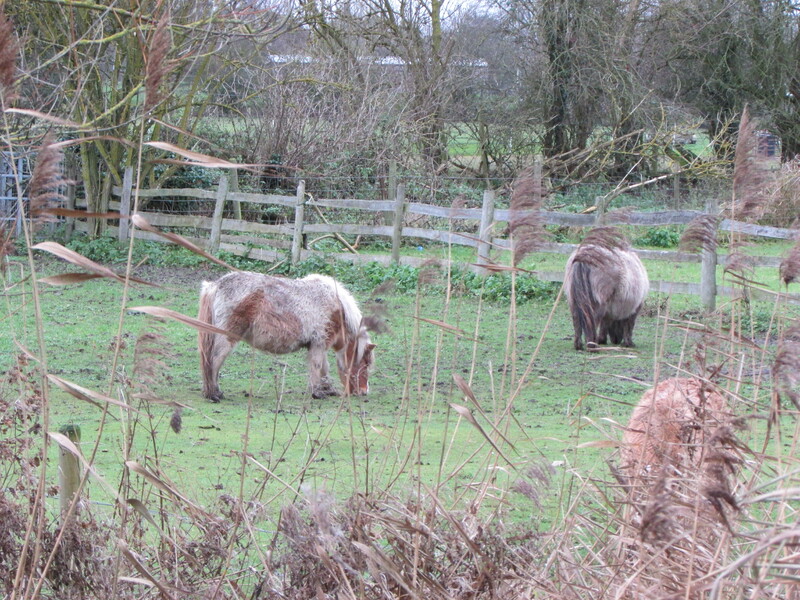 The reason was so I could do a bit of trotting in one particular spot. Now that’s always a dangerous thing to do. Firstly you pin all of your hopes on one swim and if it doesn’t work your scuppered and secondly if there’s already someone in situ when you get there, then yes your scuppered! Still it was a one off, we’re not normally too fussed if we can’t get into this particular swim as there are other areas that will produce chub and roach. However this specific spot really does suit trotting and is probably the best on this section of river for barbel, hence it’s so very popular. Anyway we arrived at out chosen destination at 4.45am and yes you’ve guessed it….someone was already in the car park. Several expletives later and we decided that if someone was that keen, then good luck to em…the filthy, dirty bas….! So it was plan B. The only problem was we didn’t have a plan B! Still we plumped on a couple of other swims and hoped for the best. I had a selection of rods with me. As explained my primary reason for coming here was to trot for barbel. The reason for that was to try out some new baits I’d received from Pallatrax, that I think will be ideal for this type of fishing. I have mentioned them before; they are small dried snails that once rehydrated in water return to their natural state. 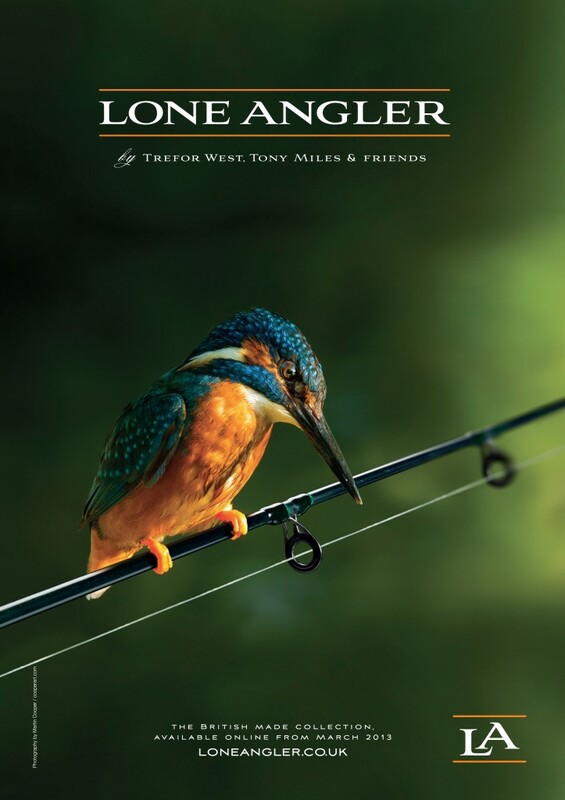 They can then be fished on a small hook (14 or 16) and offer a high protein and very natural bait. So I had my Drennan Power Float set-up for barbel, the Drennan Ultralight for chub and roach and my Torrix for fishing bottom baits, if the other method failed to produce. As the light slowly broke through the gloom of dawn it was time to run a float through the swim. The flow was much less than I expected, especially following some of the heavy rain of recent days. 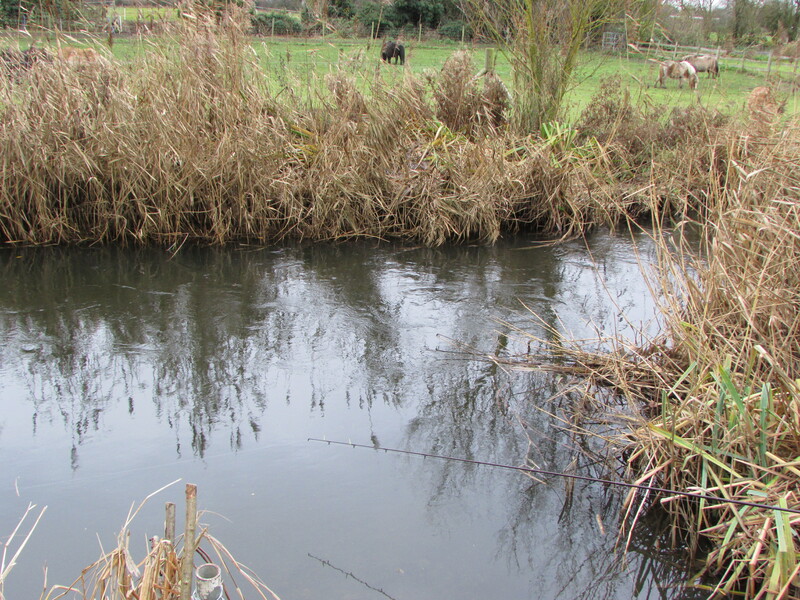 Also the flow sharply angled from the far to near bank after just a few yards, which made presentation a little tricky. 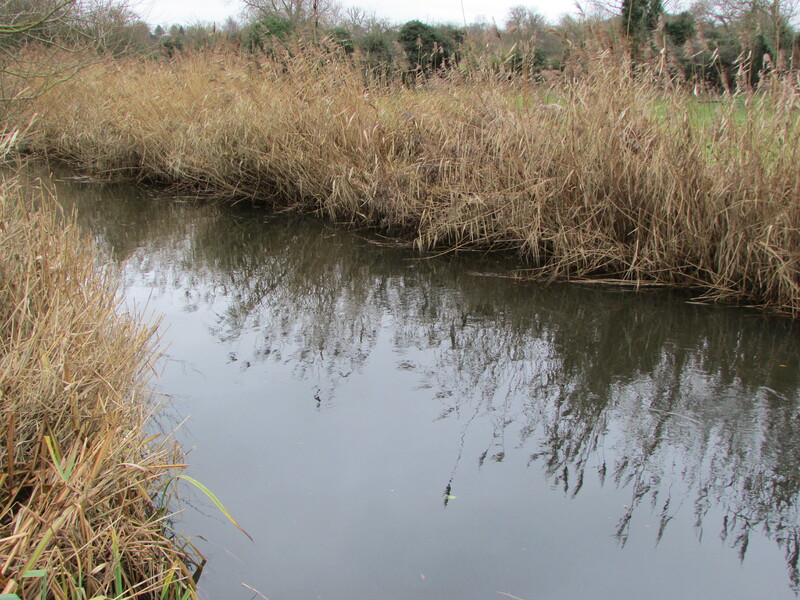 Still if the float was started tight to the reeds opposite I could get a decent trot down before the float headed to the nearside bank and disappeared from view. I had sprayed the bronze maggots with some Winter Almond spray the night before and they had a delightful (well almost) cherry bakewell aroma. I loose fed a few maggots every cast to get the swim going. If the fish started to respond then I would be using a selection of baits but maggots would be my opening gambit. After an hour I’d had one small perch and a nice roach of about 8oz. No signs of barbel. I popped down to see Geoff and on my return thought I’d give the Ultralight a go. First trot through and yes, typical, a barbel was hooked. The fish plodded off powerfully downstream. Gentle, steady pressure stopped the fish advancing any further and a tug of war ensued. The barbel sat under the reeds sulking whilst I kept the pressure up. Then it was gone. The hook to nylon had parted close to the spade end of the hook. I’m not a fan of hooks to nylon for this very reason. They seem to fail on big fish a lot and I much prefer to tie my own. Today though I thought they’d be OK for roach and dace but they are not man enough generally for barbel, in my opinion. The barbel float rod was employed again for about an hour or so but failed to produce and so the lighter outfit was put through it’s paces once again. 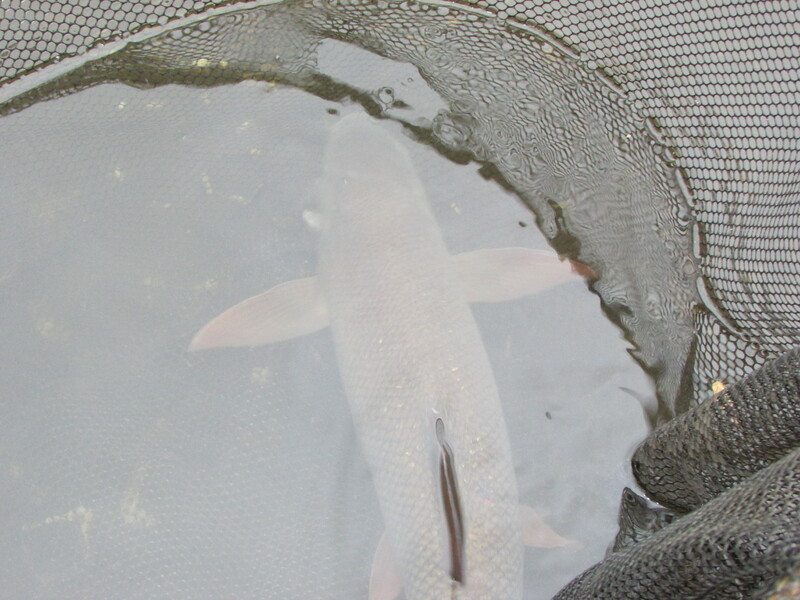 Typically first trot through and another barbel was hooked. I had this one almost ready for netting when the HTN parted again close to the spade end. I decided to change the line on the power float rod and reduce it to a mainline of 0.15mm (5.14lb) and use a 5lb hooklink. 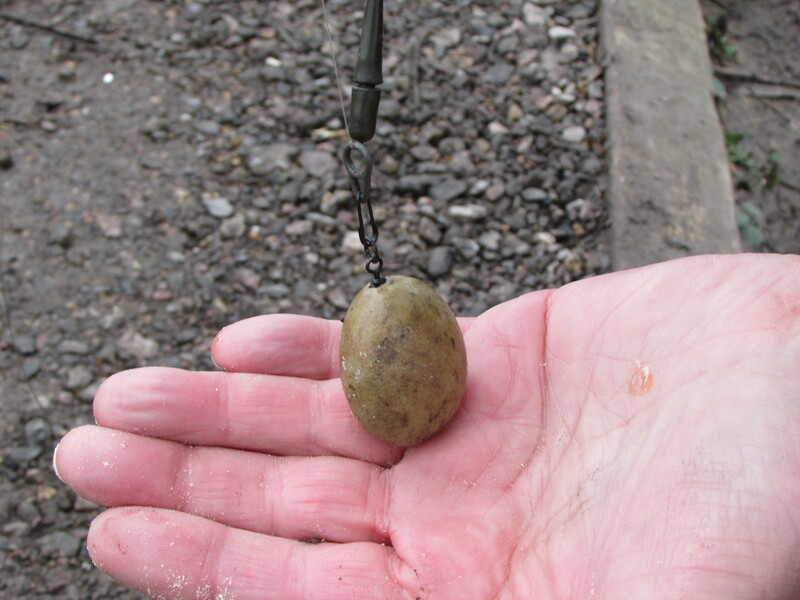 It could be that the heavier set-up was spooking the barbel. This also allowed me to use a smaller float. I had been alternating between bulk shotting and shirt button style and today the shirt button style seemed to be producing the goods. Sadly though the flow seemed to keep changing and by now the wind had picked up considerably making float presentation almost impossible. That was a shame because it can be such a rewarding method but there are times when its just not practical. So it was to the Torrix Barbel Rod that my hopes were now pinned. I was using around 3′ of Pallatrax Steamlink for my hooklink, a size 10 ‘The Hook’, a flying backlead to make sure it all stayed pinned down and a medium sized Stonze weight. It all looked very good in the margins and the Steamlink, which had been passed through the steam of a kettle, stayed nice and straight. For bait I was using the new Winter Almond squabs. They are a nice size and not rock hard either. I like slightly softer baits for my river fishing. These Winter Almond baits smell just like cherry bakewell. I think if I’d of had some custard with me I would of ended up tucking into a bowl full! 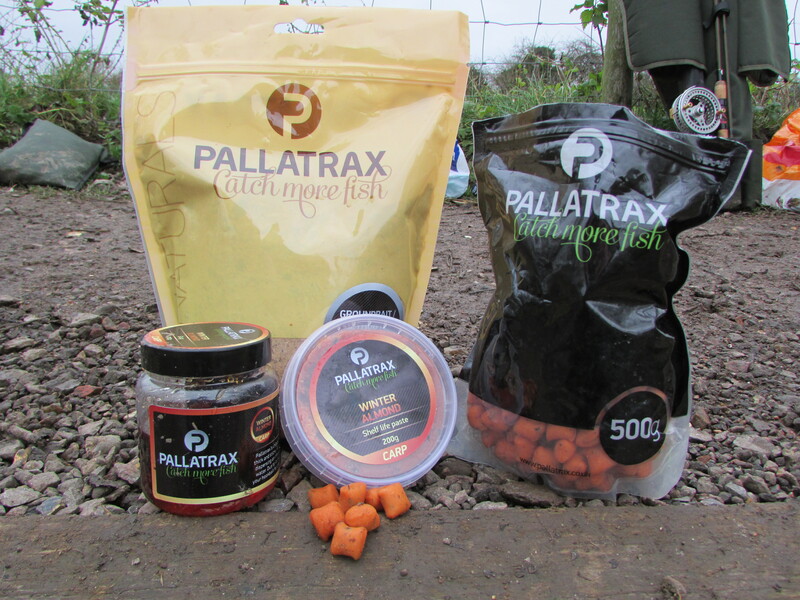 Watch out Mr Kipling there’s a new kid on the block and Pallatrax make exceedingly good baits!! Anyway I digress, I used the squabs with either paste or dipped into the thickest glug I’ve ever used and then rolled around in the maggot box to create an enticing cocktail. 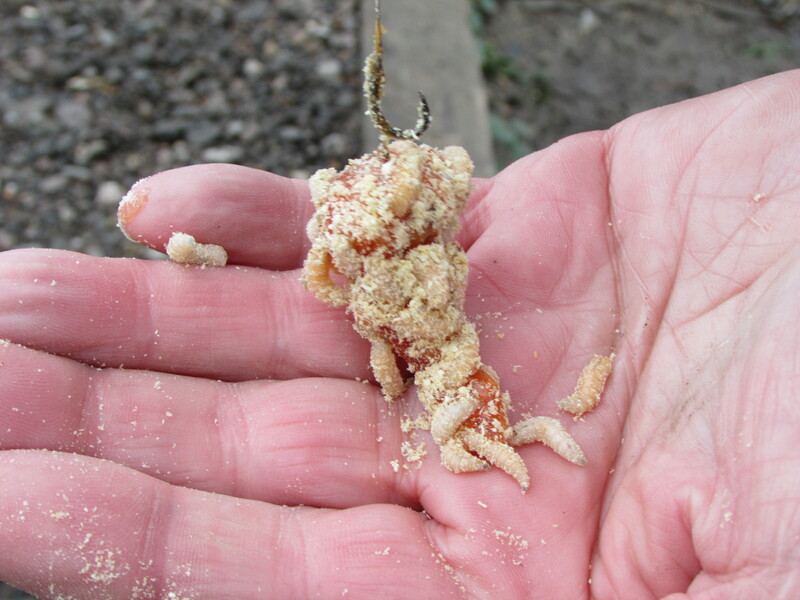 Then additionally around the Stonze weight I moulded a ball of the Bloodworm and Maggot Crush Groundbait. Keeping it slightly over damp ensured it stayed on well and allowed for a slow break down process, gradually releasing all of those nutritious little morsels for the fish to hone in on. I was fishing to a deep area just where the flow diverted and right next to the reeds. A few knocks and the rod tip hammered round. There’s nothing quite like a 3 foot twitch to get the adrenaline pumping that’s for sure. The culprit was a small but perfectly formed barbel. As always it put up a tremendous fight and I’m pleased to say there were more to follow. The time was now around 2pm and the skies had darkened quite considerably. Heavy rain was forecast for later in the day and the wind was howling across the fields. Still all the while is stayed dry we decided to persevere. Out went the bait and a short while later round went the rod tip. Another feisty barbel resulted. In fact throughout the remainder of the afternoon numerous barbel followed and I lost just one fish. It seems it’s not just me with a sweet tooth then, these Lea fish like a bit of barbel bakewell too! I was suffering with man-flu and the wind was beginning to get to me. We decided to finish at 4.30 before it got too cold. 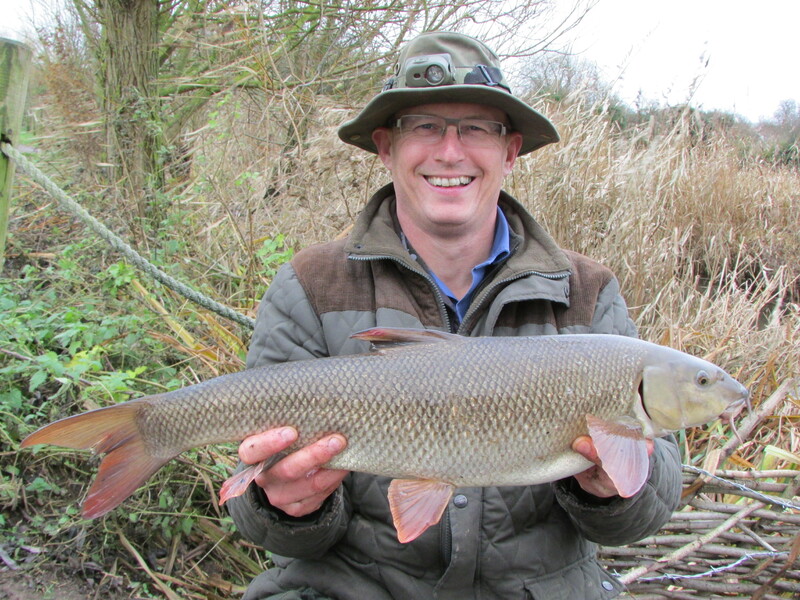 By now I’d had 6 barbel to 6lb 3oz and Geoff had caught around 10 reasonable chub and one barbel. It was great to see the rod top whack round so often for a change and one of the highlights of the day was seeing a stunning red kite glide past, which I’ve only seen here once before. In case I don’t post again before Christmas, I’d like to wish you all a very Merry Christmas and a Happy New Year.